I have always said Virginia doesn’t get enough credit and my recent research into the state’s seafood industry has given this statement some additional weight. Unbeknownst to me, Virginia is home to the nation’s largest shellfish industry and the nation’s third largest aquaculture industry for 2016. During that same year, Virginia growers and fisherman sold $56.6 million in clams and oyster alone- an $8.3 million dollar increase from 2015, despite a 22% decrease in single oysters planted. 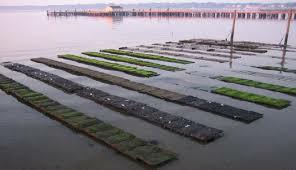 Aquaculture has become commonplace in agriculture due to a number of external and environmental factors that have hampered traditional harvest. In the Chesapeake Bay, specifically, nitrogen and phosphorus pollution have created large pockets of oxygen-depleted water, known as dead zones. The growth of dead zones (which cannot support aquatic life) and factors such as disease and increased predation have made traditional fishing less and less viable, especially for Virginian watermen. Aquaculture has grown tremendously within the state, ostensibly as a way to supplant the state’s waning fishing industry. While the majority of available economic data does not fully capture the true amount of establishments and employees vested in seafood production, available data suggest that this industry is experiencing healthy growth, especially in the state’s coastal region. For instance, Coastal Virginia and the Eastern shore accounts for the vast majority of the state’s seafood employment and output, with IMPLAN estimates placing employment at 3,778 with an estimated output of $894 million. While not widely known, aquaculture and seafood production is an important part of the state’s economy. For instance, this cluster attracts millions in outside investment through the sale of nationally distributed goods, is a significant source of employment in more isolated coastal regions, and is culturally important to the marine-based communities of coastal Virginia. Additionally, aquaculture could be an important pathway for diversifying regional agricultural markets, especially considering the high barrier to entry associated with traditional livestock operations. Aquaculture is also not relegated to coastal communities and has the potential to be implemented in all parts of the state, granted sufficient infrastructure is present. This could be a boon to under-resourced farmers across the state, especially in that seafood processing requirements are less stringent than those that govern the slaughter of poultry, hogs, and cattle. Finally, the growth of aquaculture serves a larger environmental goal of protecting and improving our coastal waters, especially the Chesapeake Bay. Overfishing combined with the above mentioned environmental factors have seriously jeopardized the vitality of several important aquatic species in the region, many of which can be safely grown and harvested in artificial environments. While more targeted environmental work is needed to fully remedy the Chesapeake and other vital coastal waterways, aquaculture could compliment these efforts in lessening the environmental impacts of traditional commercial fishing in this area. ← What does smartness mean for a city? What does smartness mean for a city? Green New Deal, or No Deal? Copyright © 2019 Office of Economic Development. All Rights Reserved. The Magazine Premium Theme by bavotasan.com.